It is natural to search for marketing methods or sales tactics that have worked for others in the past. After all, who wants to reinvent the wheel, right? The problem with this idea is that many of the traditional methods of real estate marketing that have been the cornerstones of the business for decades, i.e., door-knocking and cold-calling, are no longer the best way to survive or thrive. Times have changed. People have changed. The way in which buyers and sellers shop for real estate has changed dramatically. Just because a sales tactic worked in 2010, does not mean it is the best direction for your business in 2018 (and beyond). Now more than ever, it is valuable to be a trailblazer when it comes to marketing and sales. If you are a real estate agent, you have undoubtedly uttered the words “I don’t have time for that” at least once. The reality is that most of the time, that is an excuse and a lie. By doing an audit of the way you are spending your time, you would be very likely to discover a few extra hours per week, or per day, that could be better allocated. Our lives are filled with time-sucking activities that leach our precious time and focus and rob us of the fruits of productivity. Social media seems to be one of the biggest culprits for most. We are all guilty of wasting time and then using a lack of time as an excuse to avoid the tasks we know we should be completing. On the other hand, if there honestly isn’t any more time left on your schedule, hiring help is crucial. Make sure that you aren’t spending your valuable time on tasks that could be completed by a virtual assistant for $6/hour, freeing you up to generate more business. There is no question that it is costly to be a real estate agent. However, if you want to be successful in this business, you need to spend money. The trick is not to waste money on fads, and ROI-negative tactics like direct mail, so that you have more money to invest in the right ones. Many of the most renowned and trusted real estate coaches suggest that you take out a loan if necessary to hire strategic experts in fields like content writing and digital marketing, or virtual assistants to process your transactions. This lie comes down to good ‘ol self-awareness. Just about every training program out there will insist that you need to target sellers. However, the truth is many agents don’t even enjoy working with sellers as much as they do buyers. Remember, this is your life and your business, so you should call the shots. If you enjoy working on the buyer's side of the transaction, stay true to yourself and target the buyers. They are very profitable, generally more fun, and usually turn into sellers at some point anyway. 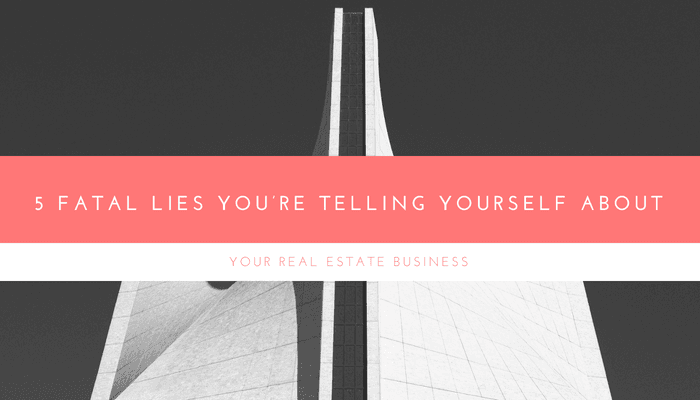 Even if statistically you are the best real estate agent in your market, it doesn’t matter if you are the only one that knows or believes that. It doesn’t matter how many awards you have received. The harsh reality is that most buyers and sellers don’t care. What they do care about is an agent that is honest, knowledgeable, resourceful, and cares about their individual needs and problems. Remember, the golden rule of content and marketing, the more you make it about them, the more they will trust you. Stop telling people that you are the best, show them that you are the best. Use your content platforms, like your podcast, Alexa Skill, and real estate blog to prove that you really are the top agent.